Around a thousand rounds of ammunition and a mortar tube were discovered in two hides about six kilometres from Omeath, Co Louth, yesterday. A senior officer told the Irish Independent last night that the ammunition and tube had been stored there for at least a year but described the find as significant. Officers are satisfied that the material belonged to a dissident group, rather than dating back to the Provisional IRA before their ceasefire, and is in good condition. Gardai called in an Army bomb disposal team as a precautionary measure shortly before lunchtime after initial fears that the tube could have contained a mortar but after a detailed examination the Army decided there was no need for a controlled explosion and returned to barracks. The tube and ammunition will be handed over to Garda ballistic officers for forensic examination. The area was sealed off yesterday evening and preserved overnight for a resumption of searches this morning. 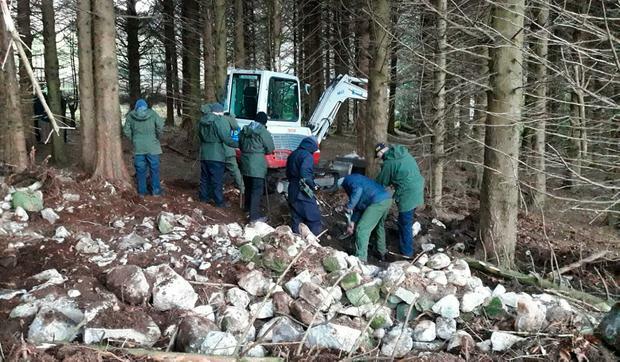 A garda spokesperson confirmed this afternoon that the search operation has concluded. Officers declined to say which dissident IRA faction might have used the dumps and the area has been used in the past by a number of groups. However, Garda security and intelligence section at headquarters in the Phoenix Park and the Special Branch have ramped up their activity in the Louth-Meath and Cavan-Monaghan divisions in the past couple of months. This action has been focused primarily on the New IRA, which is thought to pose the main threat to security on the island and is believed responsible for the car bomb explosion outside a courthouse in Derry city two weeks ago. The Special Branch has been sending extra patrols to the Border to combat a feared increase in activity by dissident republicans, as disclosed by Independent.ie earlier this week. The Garda authorities have responded by deploying additional personnel to Border divisions where the Special Branch presence had been scaled down since the peace process settled in. The patrols are being sent out regularly from the unit's headquarters in Harcourt Square, Dublin, to back up local armed personnel in the two divisions, particularly. Their aim is to increase overt monitoring of dissident suspects and make them aware they are under constant watch while also stepping up covert surveillance.